The FB-series is an entirely new engine manufactured by Subaru. The 2.5-liter FB25 is a non-turbocharged boxer four-cylinder engines which came to replace the EJ25 engine in Legacy and Forester models. The production of this engine started in 2010. The engine is full of innovations and modern technologies like small capacity version - the FB20 engine. The FB25 is built on the FB20 aluminum cylinder block. For achieving the more significant displacement, there are 94 bore cast iron sleeves, but the stroke is the same. The thickness of cylinder walls is 3.5 mm. The FB25 engine got new pistons for reducing the friction inside the block and getting down the compression ratio to 10.0:1. The aluminum FB heads consist of two pieces - the cylinder head itself and the camshaft carrier. That allows a reduction in metal thickness and weight. The heads are DOHC with four valves per cylinder. There are roller rocker arms instead of lifters. 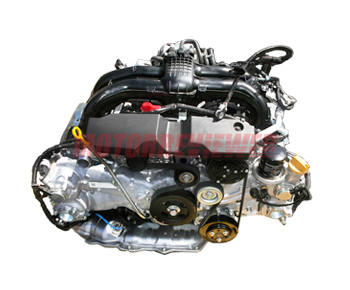 Both camshafts are equipped with variable valve timing system (Subaru dual AVCS). The fuel injectors were moved to the cylinder heads also, and injection system became more complicated but more efficient. Intake and exhaust valves and ports have been modified for better airflow. The all FB25 engines have maintenance free timing chains. The exhaust system was tuned and got new manifolds and diameters of tubes to improve catalytic converter warm-up and to give more performance for the engine. The engine was slightly modified in 2014. The manufacturer reduced the thickness of cylinder walls to 3.2 mm and changed the pistons to increase the compression ratio to 10.3:1. The heads have been revised also. They got reshaped intake ports and new 36 mm intake valves. There are the new intake manifold and lightweight exhaust system. The FB25 engine is more responsive at lower engine speeds compare to EJ25. It has the same power but lower rpm and increased torque at lower rpm. The fuel efficiency of the FB25 is a way better than the EJ25. These features make the new 2.5-liter Subaru engine is a preferable and suitable choice. The FB25 has no issues with high oil consumption instead of the FB20. The lifespan of the maintenance free timing chains and associated systems (slider, tensioner, etc.) is designed to be about the same as the useful lifespan of the engine itself. The engine is excellent and reliable; lifespan is about 200,000 miles.